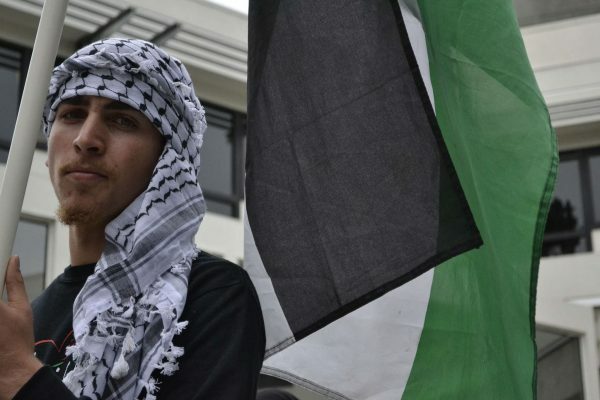 The General Union of Palestine Students paid tribute to victims of the 1982 Sabra and the Shatila massacre, an act they hold Israel responsible for, as Israeli student groups stood steps away on campus Tuesday. 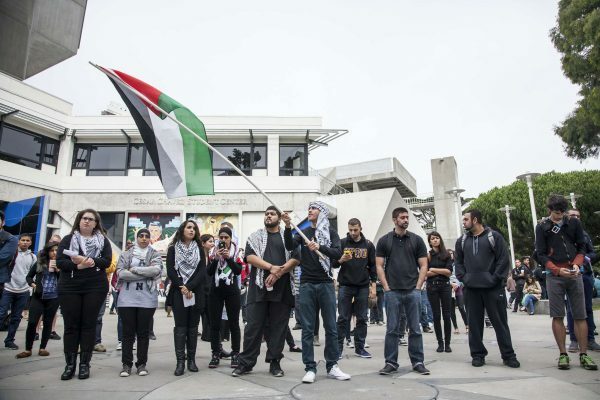 Supporters and members of SF State’s General Union of Palestine Students, as well as general onlookers, listen to speakers during a gathering to remember the Sabra and Shatila massacre in Malcolm X Plaza Tuesday, Sept. 30, 2014. Martin Bustamante / Xpress. GUPS hosted their commemoration on the main stage while other groups stationed themselves around Malcolm X Plaza. The events of September 1982, in which Lebanese Christian militants killed hundreds of people in the Palestinian neighborhood of Sabra and the Shatila refugee camp, brought conflicting sides to the affair. Israeli groups Hillel and I-Team tabled nearby to establish their presence to GUPS and bystanders, according to Jacob Mandel, a member of both groups. As GUPS performances unfolded, Hillel and I-Team members walked through the crowd of onlookers and passed out packets detailing their perspective on the massacre. Israel and its supporters deny any involvement with the Lebanese Christian Phalangist militia that launched the offense on the refugee camp and neighborhood of Palestinians and Lebanese Shiites. GUPS acknowledged the presence of the Israeli student organizations through finger-pointing and name calling, according to Hartenstein. 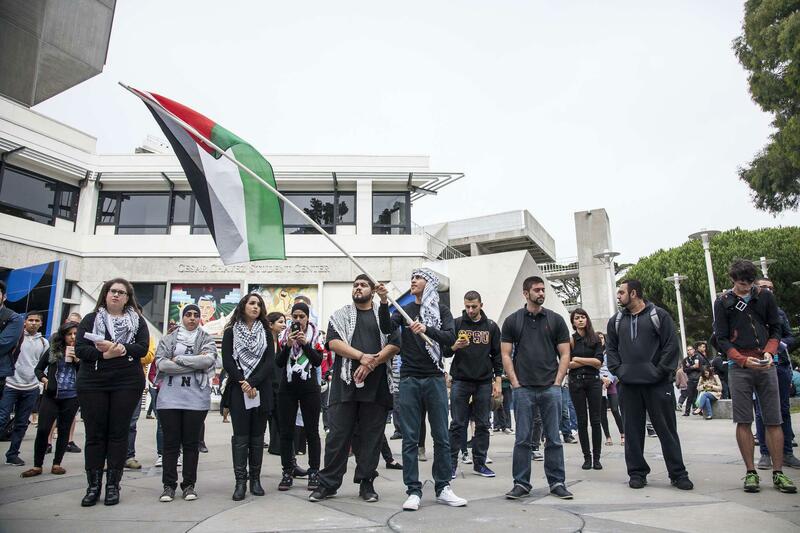 An anonymous supporter of SF State’s General Union of Palestine Students gathers at the Malcolm X Plaza Tuesday, Sept. 30 in remembrance of the Sabra and Shatila massacre of 1982. Annastashia Goolsby / Xpress. Although the Israeli organizations stood near, Morrar focused the event toward addressing Palestinian oppression and murder, and said she advocates for everyone’s freedom. Despite the political issue surrounding the event, recreation, parks and tourism management major Joselyn Franco said she appreciates being apart of the diverse campus community. Hartenstein said that the tension between the groups is warranted and that the Israel/Palestine conflict is a heated political debate at the moment. “I hope that one day we can come to a peaceful discussion and dialogue,” Hartenstein said. Did they also fantasize about killing IDF soldiers as did their previous president? Where was the banner that read, “My heroes have always killed colonizers”?